An inferno devours a building, challenging Metropolis Firehouse 23. For one of those jakes, it's a little less of a challenge: what's so tough about fighting a blaze when you're fireproof? Just the same, Kal Kent works the grindstone, coming to the calculated rescue of a mother and her boy. Within the building, firefighter Bennet is a shade more careless. With a civilian hoisted in the namesake carry, Bennet leaps from a seven story window, ignoring that there's no catcher in place, and assuming his grappling line would do the trick. Kent slips into his other hero's uniform and speeds to the plummeting Bennet before the line can be tested. The Man of Tomorrow then puts the entire blaze to bed. In the distance, viewing the whole super-heroic spectacle is a suspicious looking alien. Back at 23, Bennet argues that the team sometimes needs to take risks in order to save lives, that they can't rely on Superman. Kal agrees and praises the idea of team work and backup, but puts in a good word for asking for and accepting outside help, too. Elsewhere, the creepy alien, named Tyro, returns to his ship. He informs his comrades that he has located the one who the humans call "Superman". The crew is pleased because after all these years, Superman will pay for what he did to their home world! Story - 4: Ding-ding-ding! 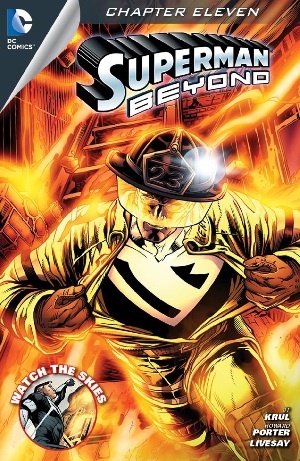 Round two, ladies n' gentlemen, and Superman Beyond comes out with a crushing right cross. The first blow lands square on the jaw as we see Kal Kent performing some human-style heroics. It may be tough to fully appreciate the good deeds of Superman's secret identity when we consider that glasses and street clothes only mask his appearance, not his powers. Either as Supes or Kal Kent, he can get the job done better than anyone. That's not the point, however. Our character needs to be in touch with his semblance of humanity, and the way he does that best is by connecting directly with people around him, and helping them. As we've seen in many stories, he does the things he does because he genuinely cares, not simply because he's powerful. Krul gets that, and he brings it to the forefront right from the beginning. I had a little bit of a problem with Kal stating right out that, "It was a good thing Superman was around." It isn't entirely troublesome, but it just feels less-than-humble, like something Superman wouldn't say. Just the same, I love the back-and-forth between Bennet and Kal. They both make excellent points. Superman isn't entirely right here, and that's refreshing. The aliens - Trillians, to be exact - are intriguing. I'm very much looking forward to seeing how that plays out. So, here we are at the start of another arc, and already the title has me on the mat. No standing 8 count. Art - 3: Porter continues to put a little more care into his art. After the mediocrity he mailed in midway through the last arc, it's nice to see some better character renderings. It's still not wonderful to look at, but it's leveled off a little bit at "passable". Livesay's inks pop pretty nicely. I just wish they were propping up better sketches. Cover Art - 4: Crackin'! This is the best cover we've seen for this title so far. I'd love to have this as a poster.